Poor Law came into existence in Elizabethan times when parishes or townships where required by law to provide money from the rates for the relief of the poor. As poor people became more of a burden on the rates of any parish they moved into, an Act of Settlement was passed in 1662. This Act now gave Local Overseers the right to decide who should qualify for relief and to distribute the money to the needy. Township officers were now able to remove strangers within the parish within forty days of their arrival, unless they occupied property to the value of £10 per year. The passing of this Act made it difficult for people to find work other than within their own township and in seeking to alleviate this problem, another Act was passed in 1697 that would enable the township officers to issue a certificate to anyone wanting to travel to search for employment elsewhere. In 1563, the poor had been catagorised into two groups: (1) These were the deserving (the elderly and very young, the infirm and tose who occasionally found themselves in financial difficulties) and they were considered deserving of support, and (2) the undeserving (those who would often turn to crime, migrant workers and individuals who took up begging for a living) who would be treated harshly. The Act of 1572 introduced a compulsory poor local Poor Tax Law. In 1576, the concept of the workhouse was formed. Until 1662, to be living there for three years. After 1662 you could be thrown out within 40 days after 1691, you had to give 40 days notice before moving in. Renting property worth more than £10 per annum in the parish or paying taxes on such a property. Being hired by a legally settled inhabitant for a continuous period of 365 days. Having served a full apprenticeship to a legally settled man for the full 7 years. Having previously been granted poor relief. Females changed their legal settlement on marriage, adopting their husbands legal place of settlement. In a situation were you or your family became, or threatened to become, reliant on parish relief and you could not satify the guidlines for having Legal Settlement, then you would become liable to be removed to the place of your last legal settlement. If you were a certificate man, then you would be sent back to your old parish at their cost, but if no settlement was in force, then a Removal Order would be applied for from the local Justice of the Peace. If this were to happen, it would involve an Examination as to Settlement to be carried out before the local justice, overseers and another ratepayer in order to ascertain your place of last legal settlement. Usually, children of poor families, orphans and widows children were often apprenticed at the parish expense to masters in other parishes. This was therefore, a means of disposing of possible future problems by altering their legal settlement status. However, if they served their full term of 7 years, then their legal settlement would be at the place of their masters settlement. The Parish Indentures were extremely important documents. Two copies would have been made, one for the master and one for the parish. Importantly, the master had a legal obligation to cloth and feed for the duration of the contract. Whenever a girl from this class reached the age of 13, she would be placed in service which had the effect of decreasing the financial burden on the household if she should become pregnant. The girl would be examined to determine who the father was and filliation orders or bastardy bonds were issued. The Poor Law changed around 1800 therefore making it possible to include the provision to pay people in kind. rather than of as well as, money and this became known as Outdoor Relief.The Bolton Poor Law Union, which included 26 townships in and around Bolton , was formed. During that year, 2 older and smaller workhouses at Little Hulton and Westhoughtn were closed. The inmates of these were transferred to better workhouses at Fletcher Street and Goose Cote Farm, Turton. Other premises which were administered by the Board included the Casual or Tramp Wards in Kingsgate, Hollins Cottage Homes for poor children in Farnworth and Townleys Hospital. Bolton Poor Law Union was constituted in 1837 under the Poor Law Reform Act of 1834 and comprised the following townships: Parish of Bolton le Moors, Bradshaw, Breightmet, Darcy Lever, Edgeworth, Entwistle, Great Bolton, Harwood, Little Bolton, Little Lever, Longworth, Lostock, Quarlton, Sharples, Tonge-with-Haulgh, Turton, Parish of Deane, Farnworth, Halliwell, Heaton, Horwich, Kearsley, Little Hulton, Middle Hulton, Over Hulton, Rumworth, Westhoughton, Parish of Middleton, Great Lever. The townships of Anglezark and Rivington where in Chorley Union and Blackrod Bolton-le-Moors parish was in Wigan Union. By the beginning of 1856,the Board of Guardians were to begin negotiations to buy land in Farnworth from Cockey Moor Church, Ainsworth, but unfortunately this sale was delayed due to the death of the Vicar. He was succeeded by the Rev. Macdonald Evanson and through him and the church, land known as Fishpool Farm was purchased in 1858 for the sum of £2880 and the foundation stones were laid the same year. The main buildings cost a total of £17,753 to erect and the outbuildings and fittings cost another £6680. The buildings occupied 8 statute acres and there was a central tower which was built to a height of 72 feet.The building was completed on 28th September 1861 and the poor people from Bolton and Turton were transferred from those workhouses. In 1861 the building housed 900 beds and was considered to be adaequate. During the course of its existence, more buildings were added and by 1864, a brand new female wing was finished with a further two blocks for the infirm being added. These later became the Russell Wards of what was to become Townleys Hospital. In 1894, a further 76 acres of land was purchased to the north of the workhouse at a cost of £10,000 and then in 1896,a new infirmary which became Townleys Hospital was built there. 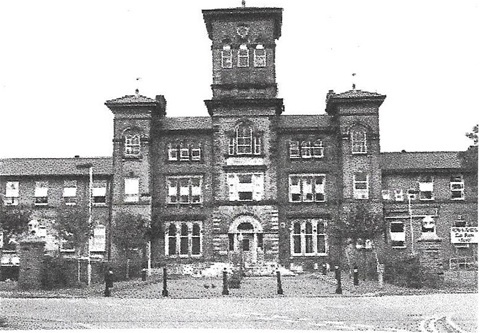 In 1913, the Bolton Workhouse, commonly known as "Fishpool's", became part of the new Townleys Hospital. In 1930,the Board of Guardians was abolished by the Local Government Act of 1929 and the running of the workhouse, which was now known as Fishpool Institution, passed to a new Public Assistance Committee. Following the inauguration of the National Health Service in 1948, Fishpool became known as Townley's Annex and later Townley's Branch. The area became known as Bolton District General Hospital and later the Royal Bolton Hospital. In 2011, the buildings of the former workhouse were demolished. There is an excellant book written by Betty Connor called A Paupers Palace, A History of Fishpool Institution, (Bolton District General Hospital) 1860-1948 which gives a fascinating insight into the history of Fishpool Institute. "Turton Workhouse", written by David J. Leeming and published by Turton Local History Society contains both text and maps of pre-1839 workhouses in Harwood, Entwistle,and Longworth together with a photograph of Halliwell Township Workhouse. Records of the Bolton Board of Guardians of the Poor for the period 1831-1948 are held by Bolton Archives and Local Studies Section of Bolton Library under the references GBO/1 to GBO/28. For more information on the history of the workhouse, see Peter Higginbottom's web site at: www.workhouses.org.uk.